Conwall Tour - An illustrated guide to Cornwall - Bodmin Moor. 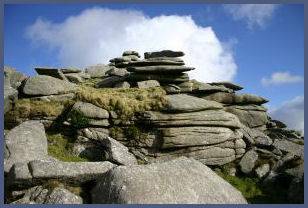 The bleak and brooding moors of Bodmin, Cornwall's unspoilt wilderness, are justly famous for their rugged beauty and spectacular primeval granite tors. 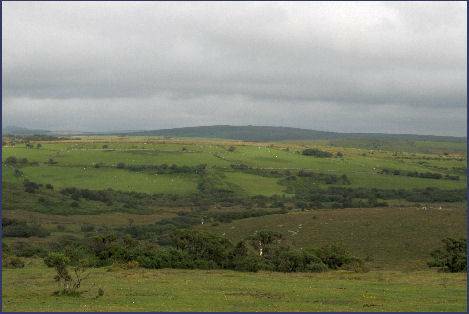 The moor is known in Cornish as Goen Bren and was once known as Fowey Moor, the river of the same name finds its source on the moor. Bodmin Moor was a very different environment ten thousand years ago, being at that time thickly forested, it was home to Mesolithic hunter-gatherers. Clearing of the trees began in the Neolithic era, from about 4,500 to 2,300 BC, when people began to farm the landscape and bury their dead in the barrows and cairns that litter the moor. The moor is a designated Area of Outstanding Natural Beauty (AONB) and is the largest area of semi-natural habitat remaining in Cornwall. 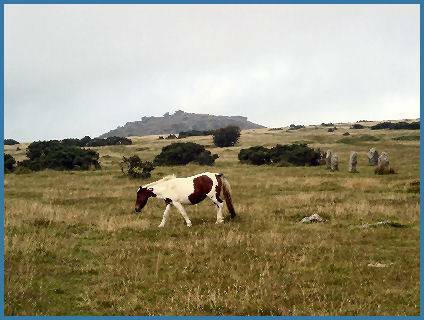 The moor consists of 80 square miles (207sq km) of granite uplands, averaging at 800 feet (250 m) above sea level and stretches between Bodmin and Launceston and north beyond Camelford almost to Tintagel and the coast. Rough Tor at 1,311 feet makes an excellent viewpoint over the surrounding area. Pronounced as 'Router', it is one of the moor's most famous landmarks. At the summit stands a monument to the soldiers who died in World War II. Just north of the tor stands a memorial to Charlotte Dymond, who was the subject of a brutal murder on Rough Tor in 1884. Her boyfriend Mathew Weeks, a simple farmhand, was tried, found guilty of the murder and hanged at Bodmin Gaol, doubt remains as to whether he was actually guilty of the offence . Brown Willy, (Cornish Bron Wennyly, meaning swallows' hill) at 1,375 feet, is the highest point on the moor and offers superb views in clear weather stretching from the coasts. The moor provides a hunting ground for birds of prey such as the buzzard. Opposite the Jamaica Inn there is a road which leads to Dozmary Pool In 1533, The Pool is said to have been fourteen fathoms deep, but it's existence is an enigma, as no stream flows into the pool nor does it drain any part of the moor. Dozmary was first used by Neolithic man- and many artefacts relating to their habitation have been found at the site. the pool possesses a strange unearthly beauty, the age old legends of King Arthur and his famous sword Excalibur are firmly associated with it. Cornwall's most famous inn, the Georgian Jamaica Inn, is situated at Bolventor and was immortalised by the novelist Daphne du Maurier. The old staging post on Bodmin Moor now serves as a hotel and restaurant serving excellent food, where smuggling and du Maurier memorabilia abound. The moorland track which runs from Minions makes an rewarding short stroll, its route passes the Hurlers stone circle (SX259714), a series of three stone circles, which is one of the finest stone circles in Cornwall. Two huge and impresive prehistoric enclosures known as Stowe's Pound encircle the summit of Stowe's Hill, the smaller enclosure is situated around the upper summit to the south and the larger to the north, surrounding the lower summit. These enclosures are similar to the tor enclosure at Carn Brea the Cheesewring, a strangely shaped granite outcrop lies within one of the enclosures. Nearby Siblyback Lake caters for watersports. Kit Hill, to the east of the moor, has a road which traverses its summit and offers some interesting walks through old mine workings along a 2 mile circular trail. From the summit the views stretch into Dartmoor in Devon. St. Neot's church, in the Glynn valley on the edge of the moor boasts fifteen magnificent medieval stained glass windows. The church dates mainly to the fifteenth century. In the churchyard stand five ancient crosses, the most elaborate of these is carved with intricate Celtic designs. A holy well, which was restored in the nineteenth century, lies near to the church, situated by the River Loveny. Near to the village of St. Neot's stands the Carnglaze Slate Caverns where guided tours are available to the subterranean lake with its fascinating blue-green water. The caverns, which were actively worked for slate quarrying and mining in the eighteenth and nineteenth centuries, are set in six and a half acres of wooded hillside in the Loveny Valley. The attractive moorland villages of Blisland and St. Breward are well worth a visit. The village of St Cleer, on the south eastern edge of the moor, has a holy well which is dedicated to St. Clarus, which has been covered by a gothic style open chapel. The commanding granite tower of the church at St. Cleer dates back to the Norman era. Situated near the village of Blisland is Jubilee Rock, a massive volcanic rock, possibly the oldest on the moor, it measures ten foot high and nearly twenty-five feet across. Lieutenant John Rogers and his men paused at the site on the fiftieth anniversary of King George III's coronation on the 25th October 1810, when they carved the stone with various coats of arms and insignia to commemorate the occasion. Bodmin Moor is littered with prehistoric megaliths, Trethevy Quoit, one of Cornwall's finest prehistoric monuments, stands on the south eastern edge of the moor. (SX 259 688) The megalithic chamber, the largest in the country, sits on a mound which it is thought covered the lower part of the stones, acting as a ramp to aid access to the chamber during burials. It consists of six upright slabs of about three metres high (10 feet) which support a capstone measuring 3.7metres (12 feet) long. The rectangular chamber measures 2 x 1.5 metres. King Arthur's Hall (SX 1296 7765) is a prehistoric enclosure standing on an area of open moorland known as King Arthur's Downs. The monument consists of fifty-six stones forming a rectangular henge measuring around 48 metres by 20 metres. 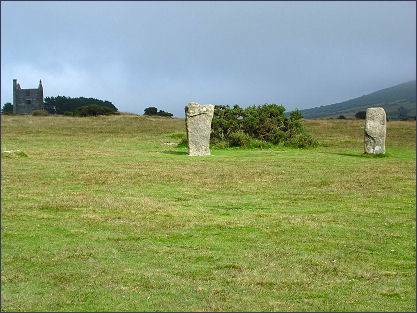 Bodmin Moor, with its brooding atmosphere and mysterious stone circles has inspired many legends. 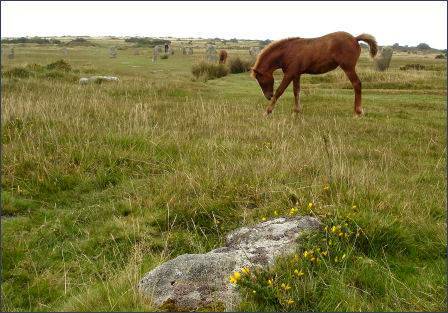 There have been numerous reported sightings of a big cat on Bodmin Moor since as far back as the 1960's. In the early 1990's, when farmers found their animals savaged, speculation began to circulate in the national press as to whether a big cat, a panther or perhaps a leopard was living wild on the moor . Photographers had captured on film what appeared to be a large catlike creature prowling the moor in the gathering dusk. Leaving from the car park at the end of the Rough Tor road from Camelford, follow the path to the summit, passing a Bronze Age settlement. There is a scramble up to the summit cairn which offers superb views of the moor, return via the same route. 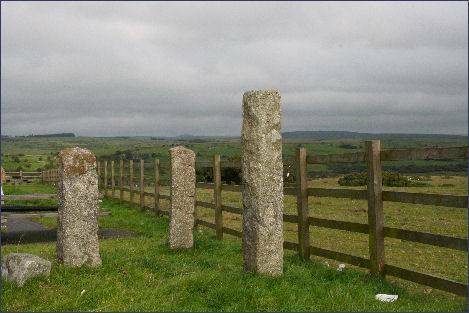 Head southeast from Camelford to the Poldue Downs, where car parking is provided. From the car park follow the path to the summit of Rough Tor. Halfway to the summit, leave the main path, taking the west track up to Showery Tor, the summit at the west edge of the ridge. As the crest of the ridge is reached Brown Willy will come into view. *Avoid walking on the moor if weather looks threatening. *A compass is required for walking on the moor in case the mist descends. *Wear headwear if walking in winter. 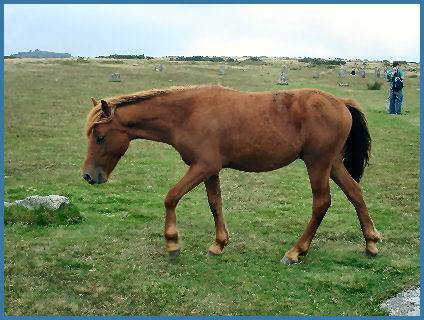 *Keep dogs under control, ponies, sheep and cattle graze on the moor.